Cai, S., Fujino, M., Lu, L. and Li, X. (2017). In vivo Priming of T Cells with in vitro Pulsed Dendritic Cells: Popliteal Lymph Node Assay. Bio-protocol 7(17): e2531. DOI: 10.21769/BioProtoc.2531. One-way mixed lymphocyte reaction (MLR) is a classic tool to measure how T cells react to external stimuli. However, MLR is an in vitro reaction system, which shows different response intensity compared with in vivo trails sometimes due to the lack of cytokines, tissue matrix and other immune response associated factors. 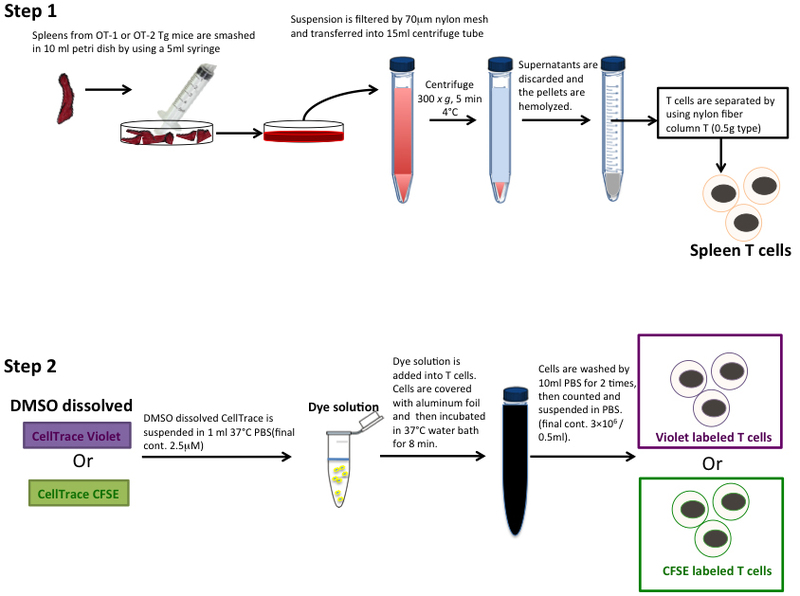 The following popliteal lymph node assay (PLNA) protocol is designed to test the T cells antigen-specific reaction in vivo by using ovalbumin (OVA) specific reacted transgenic mouse OT-1 and OT-2. In transplantation, autoimmune and infection studies, one-way mixed lymphocyte reaction (MLR) is a helpful parameter to assess whether T-cell proliferation is increased or inhibited in response to antigen present cells (APC) or other external stimuli. This is a classic functional test, which demonstrates how the T-cell is affected by the test reagents, such as immune-suppress drug (Hou et al., 2015; Zhang et al., 2015), negative cell or exosome vaccines (Ma et al., 2016; Cai et al., 2017). However, this system has some limits due to the fact that it is in vitro immune reaction system. In vivo immune reaction is affected by bio-microenvironment, such as cytokines, chemokines, hormones secretion, tissue matrix and other unknown bio-factors. Herein, the popliteal lymph node assay (PLNA) was designed as an in vivo tool to test the increased or decreased immune response by using an ovalbumin (OVA) antigen-specific reaction system (Bhatt et al., 2014; Cai et al., 2017). C57BL6/Nslc (B6) mice are kept within a CO2 chamber for 5 min and are confirmed dead. Both ends of the femoral and tibial bone cortex are drilled with a 27 G needle. 5 ml PBS is injected through the hole of one end, and bone marrow cells (BMCs) can be collected from the hole of the other end. About 5-8 x 107 BMCs can be collected from one mouse. BMCs are cultured in a 24-well TC plate as 1 x 106 cells per well in 1 ml complete medium (see Recipes) in the presence of GM-CSF (10 ng/ml), IL-4 (10 ng/ml) in 5% CO2 in air at 37 °C. On Day 2, the culture soup is removed and new complete medium with GM-CSF (10 ng/ml), IL-4 (10 ng/ml) is added to the plate (0.5 ml per well). The culture soup is centrifuged (300 x g, 5 min, 22 °C) and the supernatant is added back to the plate (0.5 ml per well). On Day 5, the cells are harvested and washed 2 times with PBS. The split ratio is about 60-80%. Cells are cultured into a new 24-well TC plate as 1 x 106 per well in 1 ml complete medium in the presence of GM-CSF (10 ng/ml), IL-4 (10 ng/ml) and IFN-γ (10 ng/ml). The final volume is 1 ml per well. On Day 6, the cells are pulsed with OVA (400 μg/ml) for 24 h. In detail, OVA is diluted in PBS at 100 μg/μl first and then added into DCs at 4 μl per well. The final volume is 1.004 ml per well. At least 2 wells of cells are untreated with OVA as negative control for the reaction. Cells are harvested on Day 7. Because the cells of interest are loosely adherent, we 1) tap the plate gently; 2) harvest the fluid; 3) flush the empty well with 1 ml PBS and collect the fluid. The harvested cells are washed with PBS three times to make sure that the redundant OVA is removed thoroughly. Cells are suspended in PBS at 1.5-4.5 x 105 per 30 μl for use (Figure 1). Figure 1. 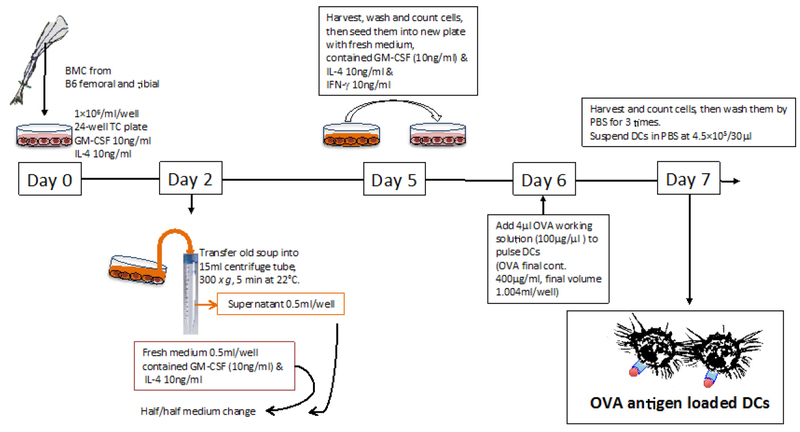 OVA pulsed DCs preparation. Bone marrow cells are isolated from B6 mice and cultured in completed medium with GM-CSF and IL-4 for 7 days. Half/half medium is changed on Day 2. BM-DCs are stimulated with IFN-γ on Day 5 for 48 h and are pulsed with OVA on Day 6 for 24 h. Cells are harvested on Day 7 and washed thoroughly before using. Spleens are isolated from OT-1 and OT-2 Tg mice. Spleen cells are hemolyzed in 4.5 ml distilled water for 6 sec followed by 0.5 ml 10x PBS. After this, 5 ml 1x PBS is added to dilute the suspension. Spleen T cells are separated by using Nylon Column T. Nylon Column T is washed by 10 ml pre-warmed RPMI-1640 slowly. Air is removed by squeezing the nylon fiber. Hemolyzed spleen cells (< 1 x 108) are suspended in 1 ml of warm RPMI and loaded onto the column. The T-shape stopcock, which connected the column and 21 G needle, is switched to let the suspension infiltrate into the nylon fiber followed by 1 ml additional RPMI-1640 loading onto the column. Then, the column is sealed and incubated at 37 °C and 5% CO2 for 60 min. After that, T cells are then eluted with 5 ml warm RPMI. T cells are labeled with CellTrace Violet or CFSE Cell Proliferation Kit (2.5 μM, 37 °C, 8 min) according to product manual. Violet or CFSE labeled T cells are suspended in PBS at 3 x 106/500 μl for use. Details are shown in Figure 2. Figure 2. T cells isolation and labeling. Spleen cells are hemolyzed with distilled water and 10x PBS. T cells are separated by nylon-wool column and then labeled with Cell-Trace CFSE or Violet. Violet or CFSE labeled OT-1 or OT-2 T cells are adoptively transferred intravenously to naïve B6 mice (recipients) at 3 x 106/500 μl/mice at Day -1. Then OVA pulsed BMDCs are injected subcutaneously into the recipients’ footpads at 4.5 x 105/0.03 ml at Day 0. The popliteal lymph nodes (PLNs) are harvested at Day 3. Lymph nodes (LNs) capsules are pierced by 27 G needle. Cells isolated from LN are filtered with 70 μm mesh and stained with CD8-PE (violet labeled T cells group) or CD4-APC (CFSE labeled group) for flow cytometry assessment. Details are shown in Figure 3. Figure 3. PLNA procedure. Step 1. Cell-Trace labeled T cells are transferred into wide type B6 at Day -1. OVA-loaded DCs are injected subcutaneously into their footpads at Day 0. The popliteal lymph nodes (PLNs) are harvested at Day 3. Step 2. Cells harvested from PLNs are stained with antibody and detected by flow cytometry. Cells isolated from PLN are detected by Gallios flow cytometer and analyzed with FlowJo V.10.0.8. Proliferation of T cells is determined by Violet or CFSE dilution gated on CD8+ (OT-I) or CD4+ (OT-II) population. Grey lines indicate PBS injection into the footpad (i.fp), used as a negative control (Figure 4). Figure 4. PLNA data. CD8+Violet+ (OT-1) or CD4+CFSE+ (OT-II) double positive population is gated for a histogram view. T cells transferred + PBS i.fp, negative control group (grey) indicates the original non-proliferation population. The proliferated population is gated and shown as a percentage of total T cells. This study was supported by research grants from the National Center for Child Health and Development (26-6, 26-27 and 27-21), Ministry of Education, Culture, Sports, Science and Technology of Japan (Grants-in-Aid 15F15756 and 15K10043). Bhatt, S., Qin, J., Bennett, C., Qian, S., Fung, J. J., Hamilton, T. A. and Lu, L. (2014). All-trans retinoic acid induces arginase-1 and inducible nitric oxide synthase-producing dendritic cells with T cell inhibitory function. J Immunol 192(11): 5098-5108. Cai, S., Hou, J., Fujino, M., Zhang, Q., Ichimaru, N., Takahara, S., Araki, R., Lu, L., Chen, J. M., Zhuang, J., Zhu, P. and Li, X. K. (2017). 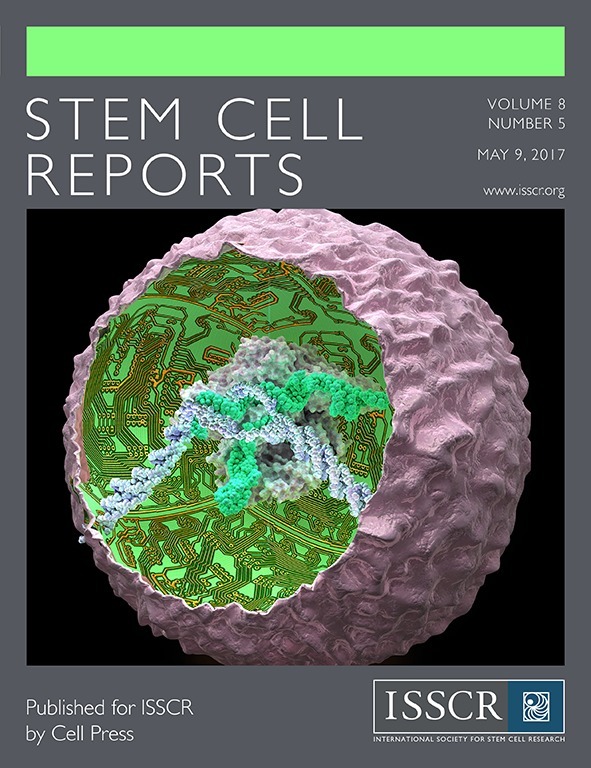 iPSC-derived regulatory dendritic cells inhibit allograft rejection by generating alloantigen-specific regulatory T cells. Stem Cell Reports 8(5): 1174-1189. Hou, J., Zhang, Q., Fujino, M., Cai, S., Ito, H., Takahashi, K., Abe, F., Nakajima, M., Tanaka, T., Xu, J., Zou, H., Ding, Q. and Li, X. K. (2015). 5-Aminolevulinic acid with ferrous iron induces permanent cardiac allograft acceptance in mice via induction of regulatory cells. J Heart Lung Transplant 34(2): 254-263. Ma, B., Yang, J. Y., Song, W. J., Ding, R., Zhang, Z. C., Ji, H. C., Zhang, X., Wang, J. L., Yang, X. S., Tao, K. S., Dou, K. F. and Li, X. (2016). Combining exosomes derived from immature DCs with donor antigen-specific Treg cells induces tolerance in a rat liver allograft model. Sci Rep 6: 32971. Zhang, Q., Ichimaru, N., Higuchi, S., Cai, S., Hou, J., Fujino, M., Nonomura, N., Kobayashi, M., Ando, H., Uno, A., Sakurai, K., Mochizuki, S., Adachi, Y., Ohno, N., Zou, H., Xu, J., Li, X. K. and Takahara, S. (2015). Permanent acceptance of mouse cardiac allografts with CD40 siRNA to induce regulatory myeloid cells by use of a novel polysaccharide siRNA delivery system. Gene Ther 22(3): 217-226. How to cite: Cai, S., Fujino, M., Lu, L. and Li, X. (2017). In vivo Priming of T Cells with in vitro Pulsed Dendritic Cells: Popliteal Lymph Node Assay. Bio-protocol 7(17): e2531. DOI: 10.21769/BioProtoc.2531.